PizzaRev is the new pizza place in town. 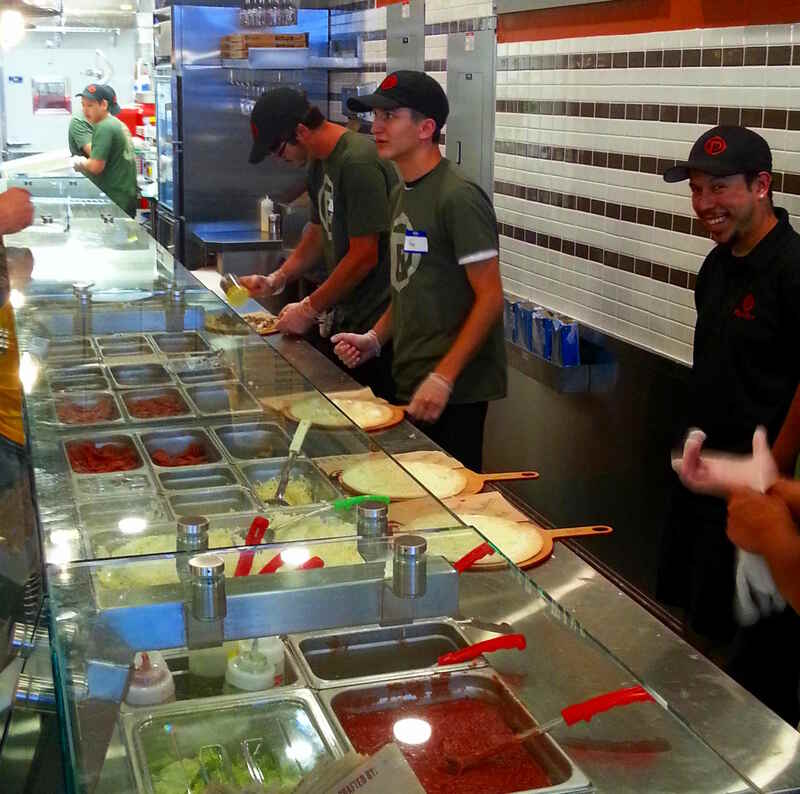 Located in the 29th Street Mall, it is a fast casual, build your own pizza and salad restaurant. Started in Southern California in 2012, this is the first outlet in Colorado. It is a simple concept of a build your own with multiple choices (similar to a Chipotle for pizza). You can get a pizza or salad, but pizza is the main draw here. You start with a choice of a regular or gluten-free crust, and then select your sauce, cheeses and toppings. We tried multiple variations. The regular crust is thin and delicious. The gluten free crust was not a favorite with its crunchy cracker texture and a touch of sweetness. The sauces are a tomato, white creamy sauce,, olive oil, and BBQ sauce—fairly traditional savory/sweet style. We liked all the sauces except for the olive oil which created a dried pizza. The fun comes in choosing your other ingredients with a range of cheeses, meats and a wide assortment of vegetables. The choices are abundant including: 4 sauces, 7 cheeses, 11 meats, 17 veggies, and once your pizza is cooked, you have a selection of 7 hot sauces, hot peppers and parmesan cheese. If all these options overwhelm you, there are some pre-selected combinations on the menu. One unique item is the Oreo Cookie dessert Pizza to satisfy your sweet tooth. 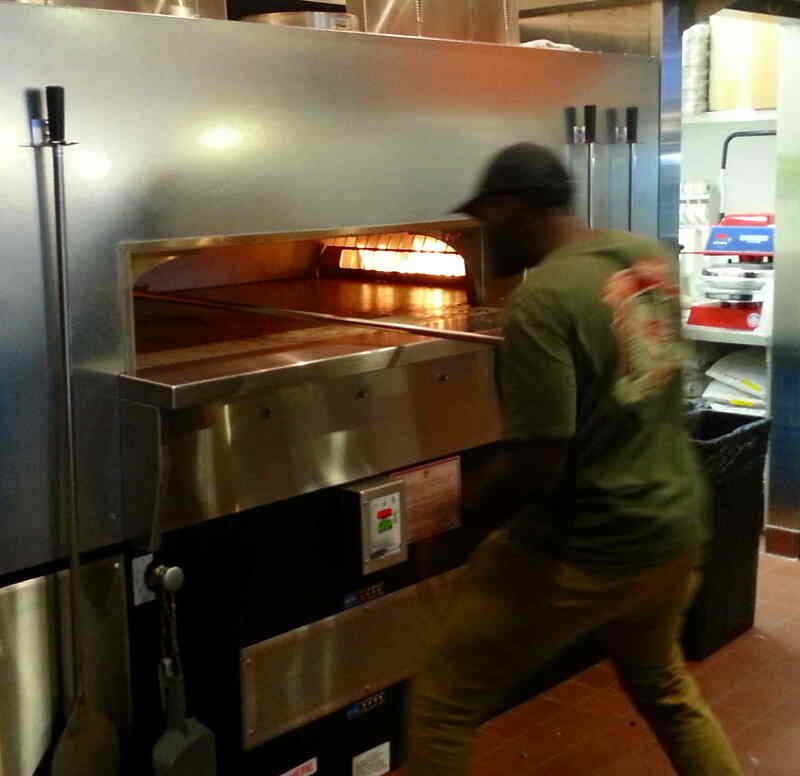 After having made your selections, the pizza is custom cooked and ready in about 5 minutes. It comes out really hot and the quick cooking time means that the vegetables are still firm and flavorful. The thin crust adds a touch of sophistication. For special diets, they offer a low fat and vegan cheese that were both quite good. Also a vegan sausage that had good flavor and moderate texture. The nutritionals on your meal are available at their site. If you want an entrée salad, you have the same choice of toppings on a bed of Romaine. Drinks are the standard fast casual selection of sodas, waters, two beers on tap and wine will be added shortly. The atmosphere is industrial chic. The prices are very reasonable—there are only 2 pizza prices $5.99 for a one cheese pizza and $8.25 for unlimited toppings-(Gluten free crust is $2 extra). These are a generously sized single servings. 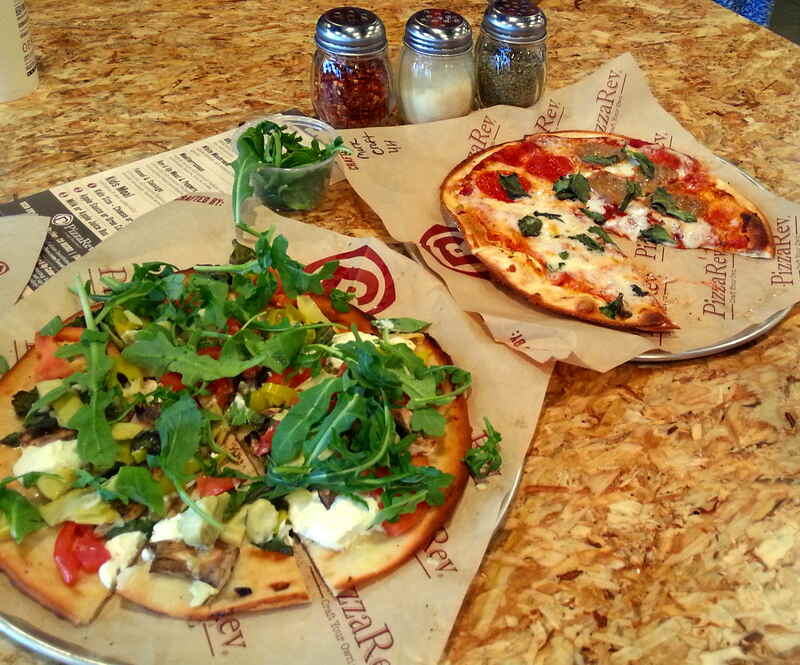 It is not the top artisanal pizza in town, yet for the price and time PizzaRev is a good choice. PizzaRev is in the 29th street mall on the west side between Canyon and Arapahoe (1650 28th street ) Hours are 11am to 10pm. Fax and online orders as well as catering are available.